Ezzy Languzzi is a Latinx writer of speculative short fiction and contemporary MG/YA. Her fantasy short story “Naranjas Inmortales” appeared in Strange California: An Anthology of Speculative Fiction. 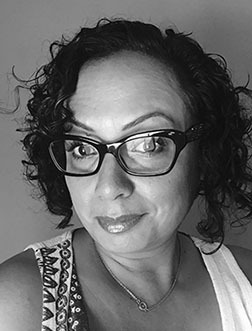 Her second story to be accepted for publication, ‘Viva La Muñeca,’ will appear in the Upper Rubber Boot Books anthology titled Broad Knowledge: 35 Women Up to No Good. She’s an MFA candidate in Popular Fiction Writing and Publishing at Emerson College and a 2017 Las Dos Brujas Writers Workshop participant. Her contemporary MG novel Where Hazard Meets Newhope was chosen as a finalist in the 2016 Pitch América competition. Ezzy holds a M.Ed. in School Counseling and B.S. in Public Administration. She lives in MA with her husband, son, and two crazy Labradoodles. Only her mother calls her Esmeralda. WOW: Congratulations on your first place win in our Summer 2017 Flash Fiction competition! What inspired you to enter the contest? Ezzy: Thank you! I can't even express how happy and surprised I was when the announcement email arrived in my inbox. I happened to be on a field trip and was sitting with colleagues at the time. They were so happy for me. Many learned for the first time that I write. To think that I almost didn't submit my story. Seeing that entries would be anonymized and judged on merit, only, gave me the courage I needed. From my experience, it's not uncommon for writers to lack confidence or fear rejection. It's human nature. It's also something I've been working to overcome. We don't know what we're capable of until we try. WOW: Can you tell us what encouraged the idea behind your story, "Los Espantos?" Ezzy: Experiences I had in the neighborhood where I grew up in Southern California influenced my writing of Los Espantos. My community experienced terrible gang violence during the late seventies. When I was in the fourth grade my family was nearly killed in a drive-by shooting. That incident led to my sisters and I not being able to step foot in our home for several days, due to trauma. A few years later, my father's barber shop was set on fire by the neighborhood gang. I was sixteen when I watched my family's livelihood burn to the ground in the middle of the night. Not a day of my childhood passed that I didn't dream of one day "escaping" to a safer community. I recognized the value of pursuing an education from a young age, because it would provide me with access to a professional career. There were times that I doubted my ability to achieve my goals, but I persevered. Even writing the answer to this question I remember the terrible feeling of being trapped and bidding my time with an eye toward the future. It's when I started writing that I examined my life and made a midlife career change. I returned to school for a graduate degree in school counseling, so that I could be the resource I'd needed most as a child. WOW: You've been through a lot, and are a true success story. Thank you for sharing your experiences. What key elements do you think make a great piece of flash fiction? Ezzy: A great piece of flash fiction should tell a story. It's a moment in time that reveals a characters' dreams, wants, desires, while evoking a sense of place. It should have a beginning, middle, and end. Writing flash is an exercise in discerning the utility of every word used. In a lot of ways, flash fiction is more difficult to write than a short story. I think it's a wonderful way to learn how to tighten one's writing. I liken flash pieces to morsels that can be written anytime, anyplace. For example, I wrote "Los Espantos" using the Notes application on my iPhone. It started as a fleeting memory and over time developed into a story of unrealized dreams and loss. WOW: I love the idea of using the Notes app on the phone to build a story in bits and pieces. You’re currently pursuing an MFA in Popular Fiction Writing and Publishing. Could share a bit about that experience, and why you chose to pursue that path? Ezzy: I've come by most of my writing education through books and online courses. I started with Writer's Digest online workshops a few years ago, then enrolled in a WOW! fiction workshop with Gila Green. I wanted to further develop my writing skills and began to explore an MFA, but feared the amount of time spent away from home, sitting in class and commuting. My husband was diagnosed two years ago with a rare form of blood cancer and we have a fifteen-year-old son. Because I work full-time during the day, being home is important to me. I happened upon Emerson's online MFA in Popular Fiction Writing and Publishing while searching low-residency programs and applied. I'm enrolled full-time and survived my first term this past fall. The key benefit of Emerson's program is that lessons are delivered through Canvas asynchronously, which allows me complete my schoolwork anytime. My first term I took a course in utopian, dystopian, and apocalyptic literature and a writer's workshop, where I read and critiqued others' work, while sharing my own. I've never worked so hard in my life. The program is rigorous and as much as I complained, I loved every minute of it, ending the term with an A in each class. The flexible, online format is the best fit for my lifestyle. WOW: Congratulations on the A that you earned, and good luck with your next courses! Thanks so much for chatting with us today, Ezzy. Before you go, do you have any tips for our readers who may be thinking about entering writing contests? Ezzy: Absolutely! First, it's critical to find a writer's group who can offer feedback on our work. Family and friends are wonderful first readers, but it's better to have writers critique our writing. They're better able to impartially comment on elements such as structure, plotting, point-of-view, and pacing. Second, read read read. Read fiction and non-fiction. Read classics, memoirs, genre. I read quite a bit more than I write. Third, take writing classes, enroll in workshops, read books on the craft. We learn as much, if not more, from critiquing other's work as we do from writing our own. Lastly, don't self-reject! Ezzy ~ Thank you for sharing the inspiration behind your story. That's what gives "Los Espantos" such an authentic feel, even though it's also a paranormal love story. I love the combo of all your elements and admire your ability to tell such a tightly woven story in so few words! I also grew up in SoCal in the 70s, and remember the gang violence. Thanks for the info on Emerson, too, and congrats on going for your MFA. "Don't self-reject!" is great advice!